If you ever imagined eating garlic without that pungent odour and taste, then try Gaganis Odourless Garlic. Cleaned white whole odourless garlic cloves are available for a 'clean' garlic experience! 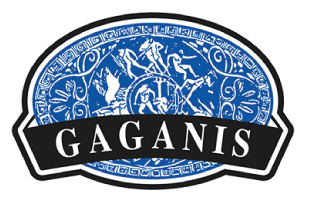 Try also our Gaganis Crushed Garlic, for something more aromatic! Gaganis Odourless Garlic Cloves are an amazing product innovation. 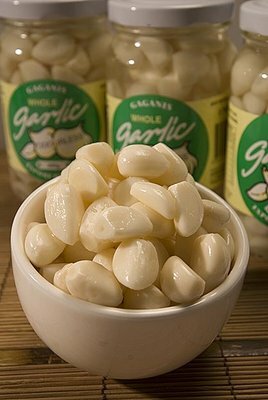 Clean tasting peeled garlic cloves can be enjoyed in your cooking, sprinkled over salads, incorporated into an Antipasto platter or just eaten out of the jar. The Odourless Garlic Cloves are clean, peeled white cloves processed and bottled in Australia. The product is available in 200g, 350g and 750g jars as well as 10kg buckets for large volume users. Our own recipe ensures that the Garlic cloves are odourless and clean tasting. For a convenient aromatic garlic experience, try our Gaganis Crushed Garlic. Our crushed garlic is available in 275g and 500g jars as well as 2.5kg buckets. Crushed garlic is a versatile product that takes the time out of crushing garlic for frequent garlic users. Also convenient for home users of garlic in cooking. Take advantage of the fresh tasting product with the full benefit of the convenience. Our crushed garlic recipe locks in the natural flavours of garlic, releasing them as you create your culinary experience.